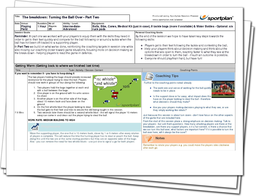 In this session we continue to build on skills in the breakdown, reinforcing the coaching targets set in session one while moving our coaching closer toward game situations, with a strong focus on decision making at the break-down - helping players to read the game and make the right decisions while on the attack! To help your players make the right decisions in the melee of the tackle this session sets up different scenarios, forcing your players to scan, communicate and work as a unit to clear the ball and keep possession! React quicker to the options at the breakdown. Will have trained hard but had fun!